Bad: yet another port of an older game. Usually, games that start out as games for one console who then get ported to other consoles are cheap cashgrab ports that just rework the controls and onscreen prompts a little bit. When that happens, developers don’t care about altering anything else about their work, adding very little benefit to the game besides it having a wider audience. Other times, devs give the game somewhat of an overhaul for their new console if they have the resources for it. Usually these are the better ports, because the devs actually put some thought into it as they think to retool some of the mechanics that were designed for different control schemes, or work in some new mechanic that was impossible on a different console. Unfortunately, Nihilumbra falls in the prior category, but sometimes it seems that even then you can pull off a decent port. In a world where color means everything, Nihilumbra is a land of black and white. You bring the color to the puzzles yourself. As with all metroidvania games, you start with limited or no abilities which expand as you go. You’re perpetually fleeing the darkness that seems to be able to find you wherever you go, and you’ll be using all your skills, abilities, and powers to escape from it. Narrating your adventure is a disembodied god-like voice with a very negative outlook on your daring escape. The combination of the dark humor of the narration and the delivery of the story makes for a really compelling reason to keep playing. Other than that there is little to no explanation to what your situation is, no background on the world and you don’t even get a name, or explanation what you are. This makes the game more mysterious, but also quite a bit empty. As you start out playing, you’ll literally get dropped into a world of black and white. As you progress and you unlock more colored abilities, your world will also adapt and start showing the colors you’ve unlocked so far. You yourself also evolve in some ways as you play, you start as a slimy blob shape, and turn into a ghastly gaseous form as you get your abilities. The great looking art direction reminds of some of the darker sides of some lovecraftian horror stories, which is also exemplified by the grotesque enemies you’ll encounter during your time with the title. As mentioned before, one of the major parts of the game is the amazing narration of the game’s story, the quality of which is amazing. For what is essentially an indie title, the narration is amazingly done. The dry, somewhat uninterested delivery of the narrator really sells his disbelief in your quest, and the story does not detract from that either. 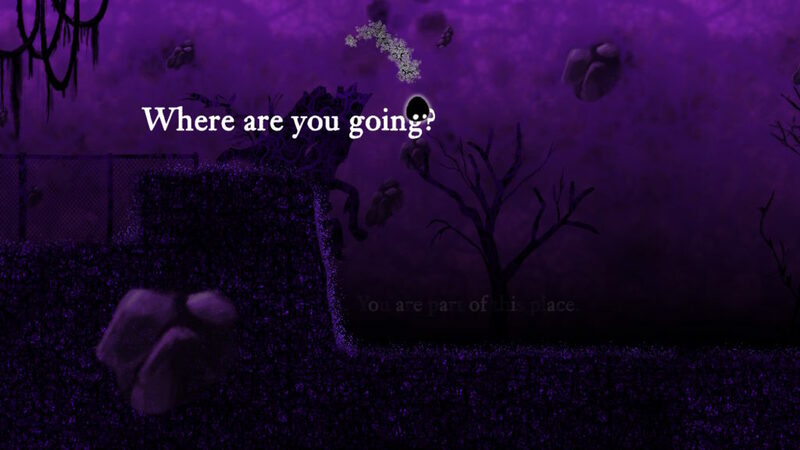 Some omnipresent ominous music plays as you puzzle along the game, driving up the creeping feeling that the impending darkness is still coming for the player, and driving you to keep going for that sweet escape. 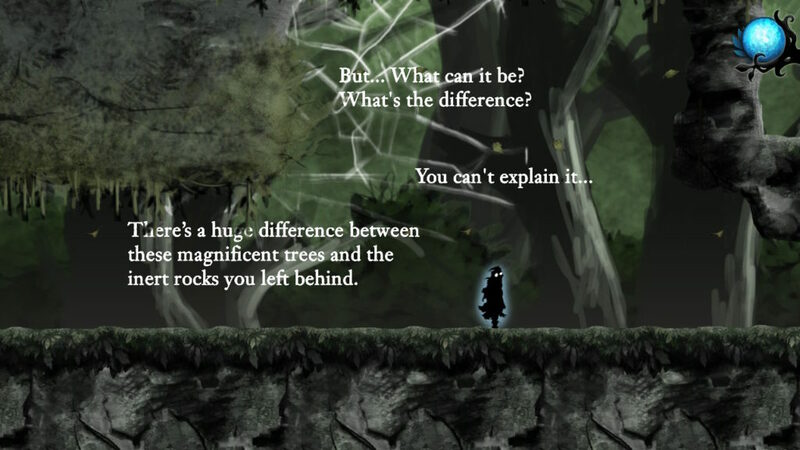 As a puzzle adventure game, Nihilumbra has not changed a lot from its previous iterations. 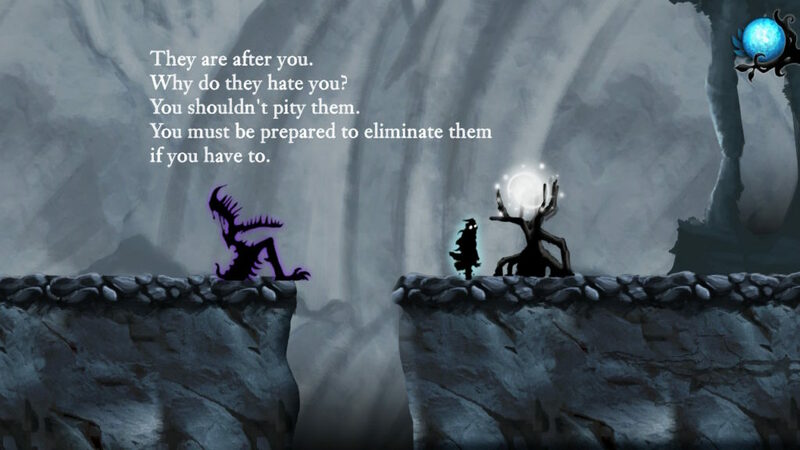 Your goal is to escape the darkness that follows you while you platform your way through the levels, which you do with the abilities you find throughout your time with the game. The abilities you get are all centered around altering the nearby terrain to change its properties. You’ll have the ability to change the floors to ice to speed you and the enemies up, to earth to keep clinging to them and the walls, grass powers that let you bounce yourself and more. All of these alterations to the terrain are made by using the Switch’s touch screen (which we actually forgot existed for a moment there). Every zone gives you a new ability, and introduces new puzzles to solve with the ability you obtained. Unfortunately, there is not a -lot- of challenge, as most puzzles are fairly straightforward, or get explained when you encounter them. This makes the game fairly easy, as well as with the short length of the story and the abundance of checkpoints. 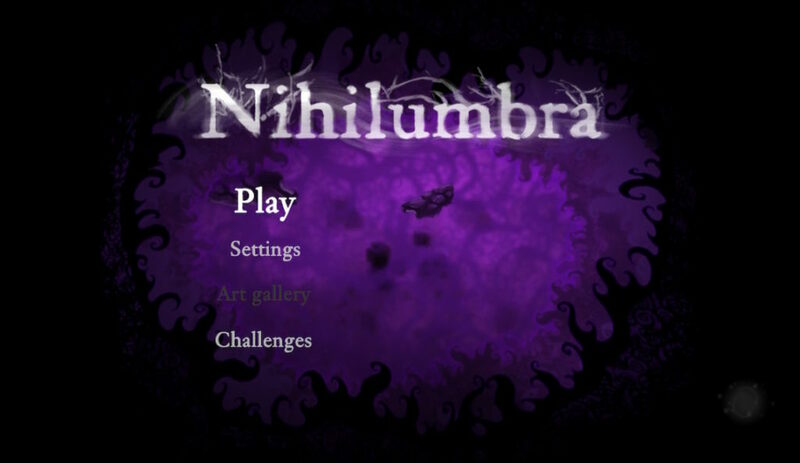 Nihilumbra is one of those indie titles that become notorious and get lots of releases on lots of different platforms. From PC, to mobile devices, to the Wii U, PS Vita, and now the Switch. At some point we should start wondering where it’ll run out of steam and stop being released on different platforms. Because while the game is a nice experience regardless of what platform it is on, there is very little added benefit to getting the title on the newest platform that isn’t already on other consoles anymore. As the developers don’t intend to expand on their 6 year old game at this point, all they’re doing at this point is holding out their hands and hoping for some more money. Meaning this title is worth playing, but not worth purchasing over and over again if you’ve already seen the game through in its entirety before.